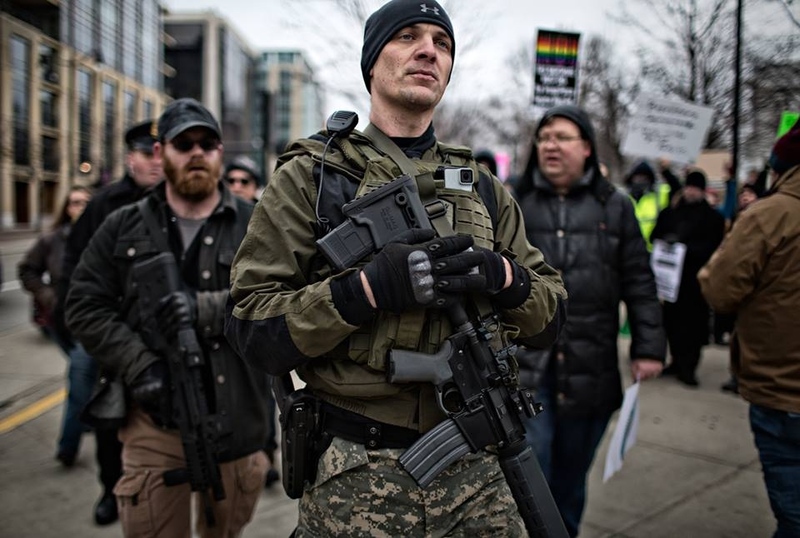 January 12, 2019 - Madison, Wisconsin: Anthony Dunsel from the United Patriots holds his rifle while deliberately walking through the counter protestors during the "We The People" rally. We The People rally brought together about two dozen armed individuals from various locals who wanted to display and exercise their Second Amendment right to bear arms. "The government should not have any say into what your rights are or are not" said Anthony Dunsel who had a side arm and an assault type rifle and wore a bullet proof vest. Dunsel continued: "Government has a role in the society but a limited one and (pointing to his rifle) this is what keeps it limited."